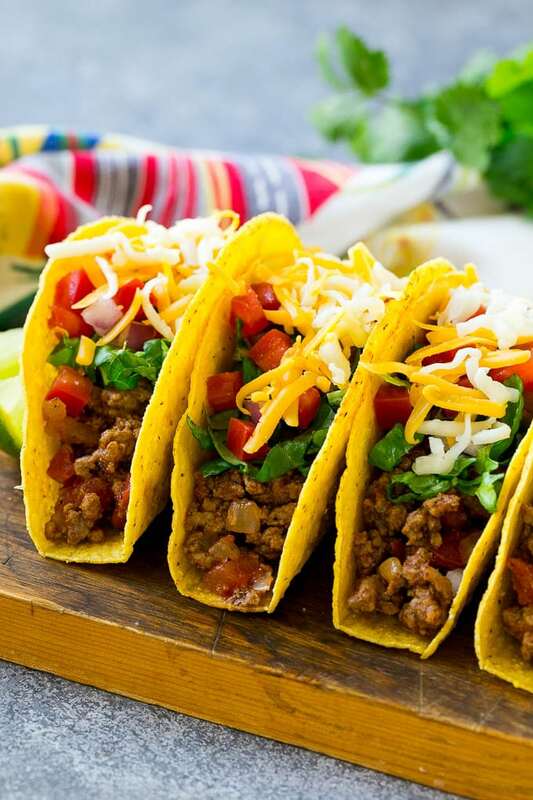 These crispy ground beef tacos are filled with seasoned meat, lettuce, cheese and tomatoes. An easy dinner recipe that the whole family will enjoy, even your pickiest eaters! 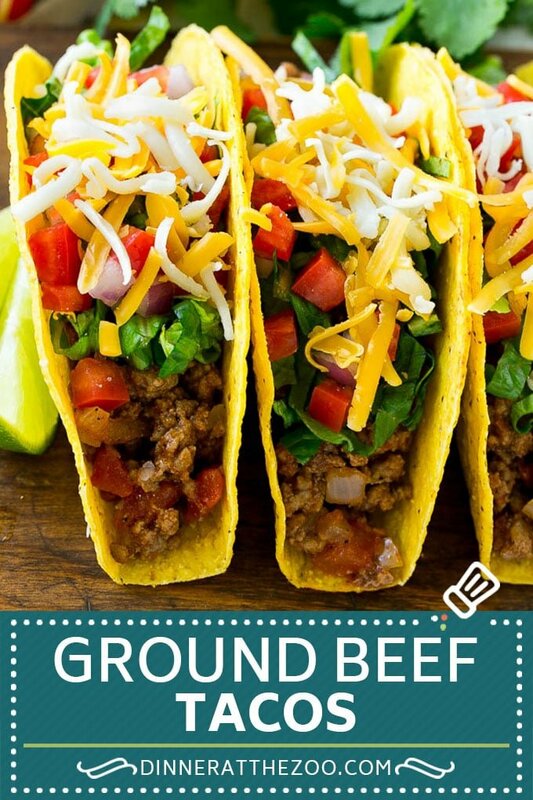 Includes a recipe for ground beef taco seasoning. 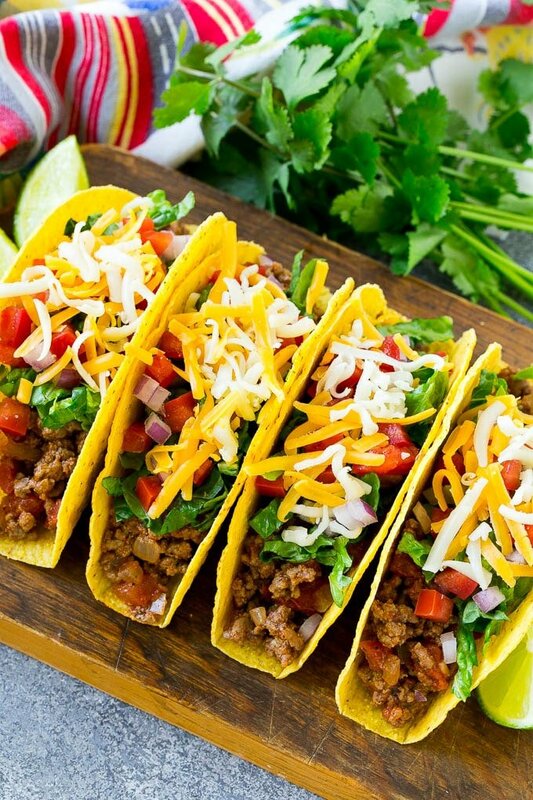 My beef tacos are so much better than the fast food version, especially when you use homemade taco seasoning instead of the store bought kind. Best of all, this dinner can be on the table in 20 minutes. When I’m looking for an easy dinner that I know my kids will happily eat, I often turn to tacos. I make these ground beef tacos almost every week, they’re so fast to make! I put out a condiments bar and let everyone assemble their perfect taco, this is a great recipe for entertaining too. 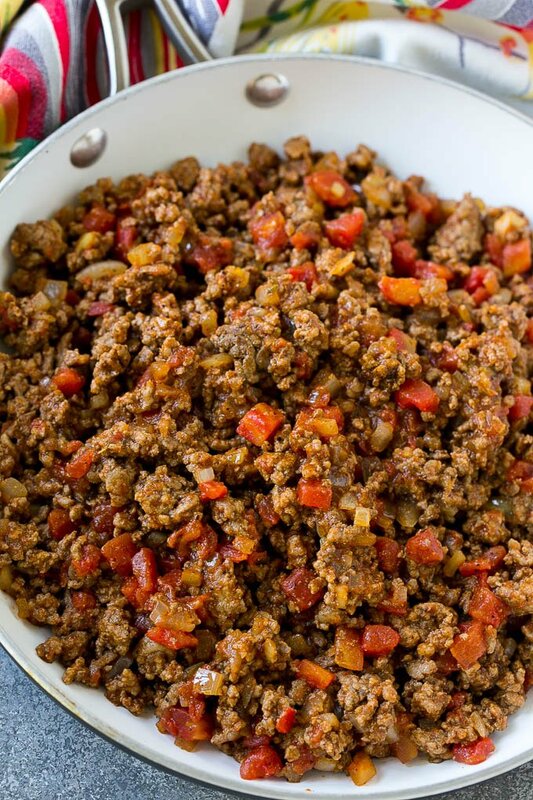 To make taco meat, you’ll need ground beef, taco seasoning, an onion and canned tomatoes. The onion and beef are cooked until browned, then are seasoned with homemade taco spice and tomatoes. I use petite diced tomatoes which I drain before adding to the meat. I like the flavor and texture that the tomatoes add, but if you’re not a big fan of tomatoes they can easily be omitted. How do you make taco seasoning? I use homemade taco seasoning for this recipe, it only takes 5 minutes to make and tastes so much better than the store bought taco seasoning packets. 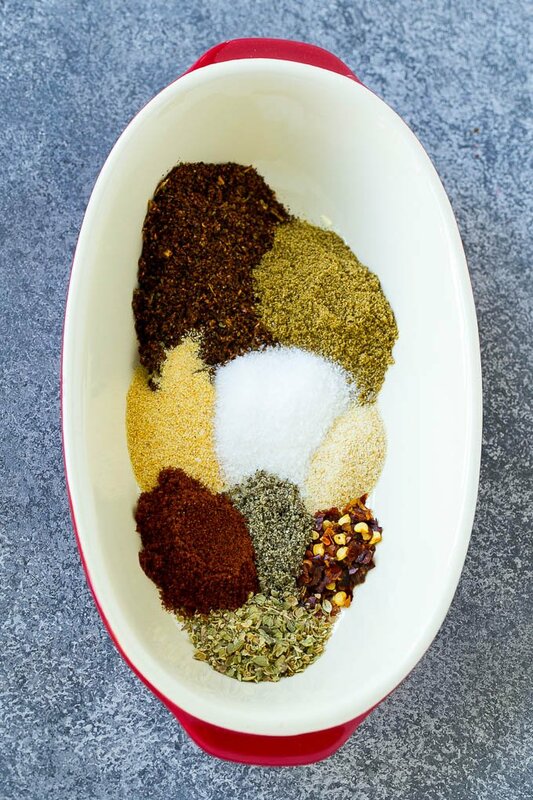 For homemade taco seasoning, simply mix together chili powder, cumin, garlic powder, onion powder, salt, pepper, smoked paprika, oregano and red pepper flakes. I like to use 90% lean ground beef for tacos. The meat is flavorful and tender, yet not overly greasy. You can also use an 80% lean ground beef, but you’ll have a lot more fat to drain off at the end of the cooking process. After your meat is cooked, it’s time to start filling your tacos! I use the traditional hard shells here, but soft flour tortillas will also work great. After your tacos are assembled, it’s time to eat! Sometimes I make a double batch of the ground beef taco filling and freeze half for another night for an even speedier dinner option. Add the ground beef and break up with a spatula. Cook, stirring occasionally, until beef is done and onion is soft, 5-6 minutes. Drain off any excess fat. Add the chili powder, garlic powder, onion powder, red pepper flakes, oregano, smoked paprika, cumin, salt and pepper to the pan. Stir to coat the meat in the seasonings. 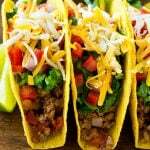 Spoon the beef into the taco shells and add toppings such as lettuce, tomatoes and cheese. Serve immediately. Looks yummy! Could these be made ahead of time and then re-heated in a crock pot? Yes you can make the meat ahead of time and reheat! I wouldn’t try to reheat filled tacos as the shells would get soggy. We enjoyed this recipe last night. Thanks from Danville! 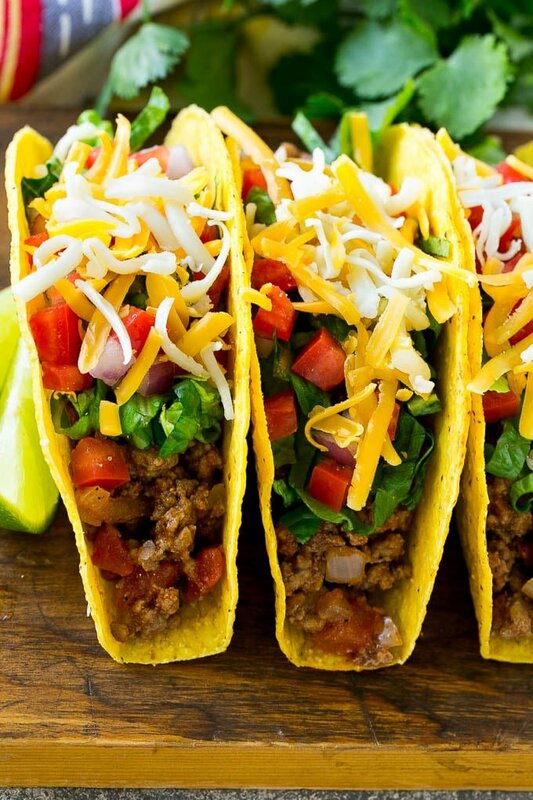 Every night here can be taco Tuesday as tacos are a family favorite and these look so yummy! You had me at tacos! These look so yummy, I can’t wait to try them! I am a major taco girl. I cant eat these with beef due to my new pescatarian diet but i can substitute it with shrimp! Lovely tacos you’ve got there. And your proteins look so perfectly cooked. Love too that you’ve got lots of spices for your taco. Tacos! Who wouldn’t love that? This is so perfect this weekend. I’ll try this one out! You can never ever go wrong with a good taco! These look so good! I think I want them for my dinner now!! these would be perfect for a tacos bar that my friend wants to do this upcoming weekend for mothers day i am gonna pass this along to her, thanks! tacos are the best. We love tacos here at my house. I love beans and avocado on my tacos.